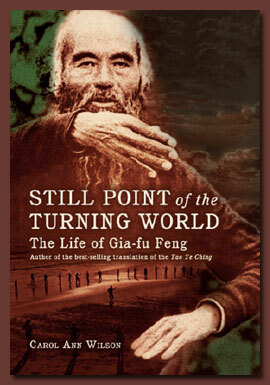 Still Point of the Turning World: The Life of Gia-fu Feng interweaves the life of translator, teacher, Taoist rogue Gia-fu Feng with the tumultuous historical tapestry of 20th century China and the United States. From Chinese warlords, Japanese occupation, and World War II to 1950s disillusionment, the Beats, Esalen and beyond, the story traces major events and personalities on opposite sides of the world. In the mix is Gia-fu and the Stillpoint community’s best-selling translation of the Tao Te Ching, the ancient Chinese classic that is the most translated book in the world, next to the Bible. Still Point of the Turning World tracks a life that began with external privilege but culminated in the gradual discovery of the still point within.